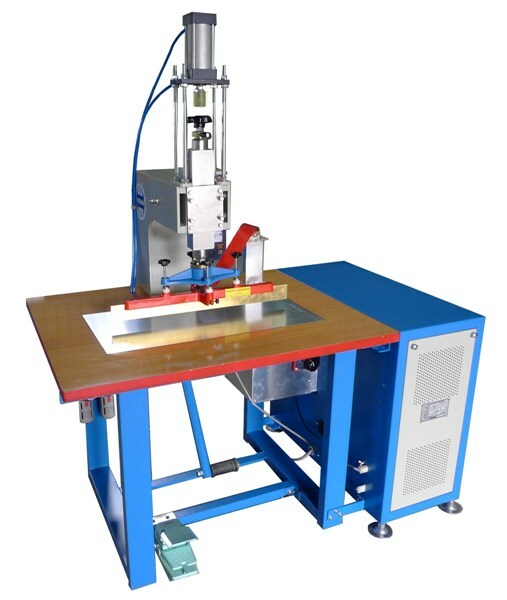 The DT type High Frequency Plastic welding machine is made especially for Canvas Welding. This machine has proceed a special treatment to deal with high-frequency interfere with electronic devices such as television broadcasts; it is suitable for Canvas shops which are located in residential area. 1. What type of material is suitable for high frequency welding? 2. What�s the different between High Frequency Plastic welding and Heat Sealing? A. These two method might seem very similar, however, two very different principle are applied. High frequency plastic welding machine apply high frequency signals onto the PVC material, making the Molecule of the friction material oscillate rapidly thus create internal heating, and material temperature rises and bound together. The heat welding is using normal hot electric heating device consists of an external heating on products, such as heating of PE materials. 3. What cause the spark during high frequency welding? A. The most common cause of sparkle is the dirt. Clean space is required for high frequency welding, especially around electrode. The applied product also must not contain dirt or the sparkle will be very likely to accrue. 4. How to choose the suitable high frequency output power for your product? A. Commonly speaking, 1KW of high frequency output can weld 12 cm2 of welding area. You can approximate the output power you need according to your product�s welding area. 5. What type of pen or pencil can I use to mark on welding product? A. Please do not use pencil or marker. Anything that contain carbon will cause the spark. 6. How to adjust the output power. A. The size of die has a direct relation with the output power. Dies of different sizes lead to different strength of current. In general, large-size molds need a larger current.